The turbulent love lives of two musicians in Texas. With his recent output, Terrence Malick has become the very definition of a divisive filmmaker. His critics dismiss The Tree of Life, To the Wonder and Knight of Cups as little more than feature length perfume commercials populated by entitled white men and twirling pretty women. For this reviewer they've been close to religious experiences, tapping nerves so personal I've found it difficult to let my guard down and write about them in an honest fashion. Each of the three aforementioned works have had a profoundly enlightening effect on me. When the cinema lights turned on at their conclusion I found myself walking out into the city streets with a new, if brief, appreciation of my surroundings, of my world, of my life. They've made me want to be a better man. I guess this is how believers feel when they go to church. All great things must come to an end though, and sadly Song to Song is like attending church on the Sunday the priest decides to bring his acoustic guitar to work. 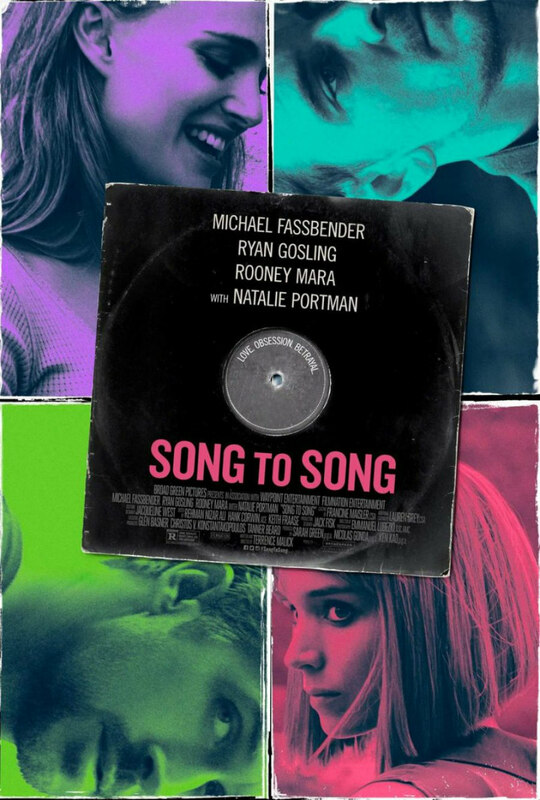 Set against the backdrop of the vibrant music scene in Austin, Texas, Song to Song is Malick's most straightforward narrative since The New World, essentially the story of a love triangle, or perhaps a love trident would be a more apt description, as one of the trio is portrayed as though he's the devil. We focus mainly on Rooney Mara's Faye, who has an enviable gig playing guitar in Patti Smith's backing band, yet behaves as though her career is on the skids. Faye finds herself torn between two men, Michael Fassbender's deceitful Irish record producer Cook and Ryan Gosling's sweetly charming songwriter BV - few female members of the audience will have much sympathy for her mopiness. Filmed in the same style as his recent work, detractors of Malick will say Song to Song is no better or worse than the previous three films, but this is more than several notches below them in quality. Malick feels out of his depth here, giving us a young female protagonist as if to answer the criticisms of his recent work. I certainly couldn't connect with her, and I doubt too many women will either. Negative reviews of Malick's work often claim his characters are non-existent, but that's why they have such a profoundly unsettling and enlightening effect if you're willing to engage with them. The protagonists played by Tye Sheridan, Ben Affleck and Christian Bale are ciphers into which we project ourselves, as though we're playing the most perspicacious video game ever constructed. With Song to Song the characters are overwritten, or rather over-improvised. We learn too much about them, and the more we learn, the more distanced we become from their concerns. If you're an attractive young woman with a great job who finds herself torn between two ridiculously handsome men, perhaps this will be an eye opener, but for the rest of us it's a movie that would no doubt be a slog were it directed by most other filmmakers. 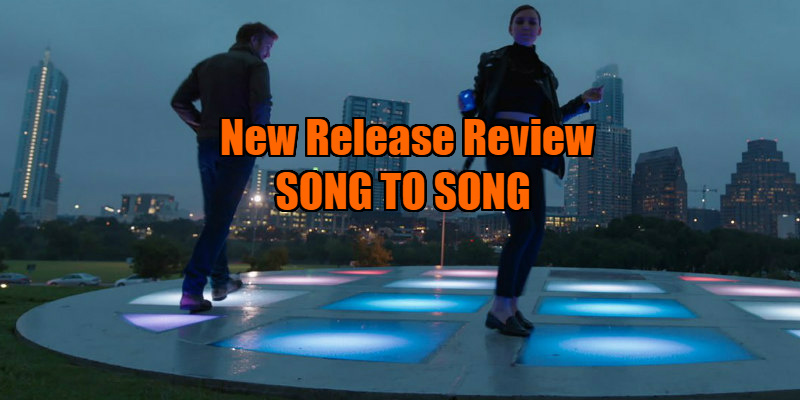 As you might expect from Malick, collaborating once more with cinematographer Emmanuel Lubezki, Song to Song is packed with stunning imagery, though setting his film in an architecturally bland city limits the distractions for his camera. 'Any experience is better than no experience,' Mara's Faye remarks. Any Malick is better than no Malick, I guess, but for anyone deeply moved by his incredible recent output, Song to Song is the big disappointment of 2017. Song to Song is in UK cinemas July 7th.